Michael calls it “my new favorite song” and adds that “this version has a killer groove.” Indeed it does, my man. Quite a jam on that one as it goes from “Bo Diddley” to a bit of “Who Do You Love” at the end. I’d been searching for a vinyl copy of “Smokin’ O.P.’s” for some time, and finally came across it this summer at a record show in New Brighton, Minnesota. It was worth the wait and it was worth the $10. Bob Seger’s early stuff — recorded before he hit it big with the Silver Bullet Band in 1976 — is terrific. It’s passionate, hard-rocking and energetic. We’ve featured some early Seger here before, just about a year ago. 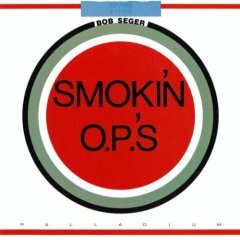 “Smokin’ O.P.’s” is an album made up largely of covers, sort of a bridge between the earliest Bob Seger System tunes that were big mostly only around Detroit and some early ’70s solo albums that were big mostly only in the Midwest. “Bo Diddley” is the first cut on “Smokin’ O.P.’s.” It’s a Bo Diddley cover, of course. It’s followed by covers of tunes by Stephen Stills, Tim Hardin and Leon Russell. They’re all tasty, especially “Love The One You’re With,” which has some driving chukka-chukka guitar by Mike Bruce and terrific vocals by Pam Todd and Crystal Jenkins. “If I Were A Carpenter” has plenty of nice Hammond organ by Skip Knope. Seger delivers a scorching vocal on “Hummin’ Bird,” backed by the ladies. “Bo Diddley,” “Love The One You’re With,” “If I Were A Carpenter” and “Hummin’ Bird,” Bob Seger, from “Smokin O.P.’s,” 1972. It runs 17:50. This one of the few early Seger records to get a CD release.